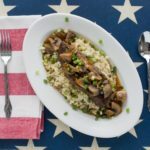 Asian-Style Boneless Beef Short Ribs recipe you can make in the Instant Pot or any type of pressure cooker. OPTIONAL: 8 ounces each of water chestnuts and/or bamboo shoots. Season the boneless beef ribs lightly with salt and pepper. Turn Instant Pot on high sauté mode, and spread a thin layer of fat/oil to keep the ribs from sticking. Sear the ribs for about 1-2 minutes on each side. You will probably have to do this in batches. Remove to a platter and cover with aluminum foil. Mince the garlic, ginger and pepper (or use a food processor as I did) and add to the pot with the onions, cooking while stirring for about one minute. Return the beef ribs to the pot and add the stock, water, coconut aminos, vinegar and fish sauce. Make sure the ribs are just covered in the liquid. Pressure cook on high for 35 minutes. Use natural release for 5 minutes followed by manual release. Remove the short ribs to a separate platter and cover them with foil to keep warm. Return the Instant Pot back to high sauté mode. Add the shiitake mushrooms, and the juice and zest of one orange, and continue simmering until mushrooms are softened – 5-10 minutes. OPTIONAL: add water chestnuts and/or bamboo shoots. Place the beef short ribs back into the pot and coat them with the sauce. If you use bone-in short ribs you will need closer to 5-6 pounds to get the same yield. The cooking time and rest of the recipe would be the same. For a smooth sauce you can strain it before adding the mushrooms, water chestnuts and bamboo shoots.